A report issued Wednesday contends Michigan could shut down Line 5 — Enbridge Energy’s embattled pipeline beneath the Straits of Mackinac — with little economic disruption, due in part to the state’s shifting energy needs. Michigan is absorbing all the risk and reaping little benefit by allowing the Canadian energy giant to operate the pipeline, Groundwork Center for Resilient Communities, a nonprofit advocacy group based in Traverse City, concluded in the report. That’s because most of the oil flowing through the 645-mile Line 5 merely passes through Michigan en route to its Canadian neighbors, the report said. Released at the Detroit Regional Chamber's Mackinac Policy Conference, the report seeks to turn up the heat on state officials weighing the pipeline’s future and rebut Enbridge’s contention that Line 5 delivers a crucial supply of energy to Michigan. Line 5 isn’t a topic at the forum. The report criticizes Gov. Rick Snyder’s support for replacing Line 5 by constructing a new Straits pipeline surrounded by a tunnel, an effort researchers expect to take up to seven years and more than a half billion dollars. “Canada will be very appreciative if Michigan builds them a tunnel,” Jim Lively, program director for Groundwork and an author of the report, told Bridge Magazine. Ryan Duffy, an Enbridge spokesman, told Bridge he isn’t sure “what’s new” about Groundwork’s arguments, compared to criticism elsewhere, and noted the pipeline already has been extensively studied. 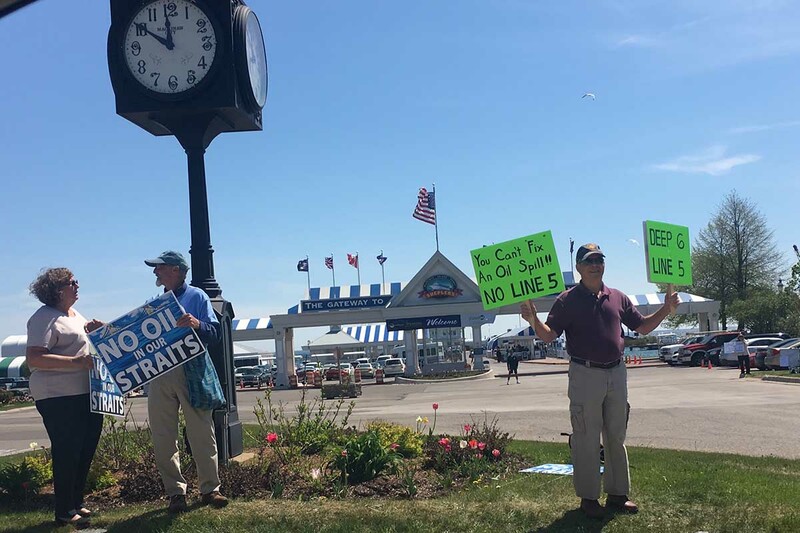 Line 5 has become a sizzling political issue amid fears a rupture would threaten the Great Lakes and allegations that Enbridge has not been transparent about the pipeline’s condition. In November, Snyder announced an agreement that requires Enbridge to replace a Line 5 piece beneath the St. Clair River and construct a tunnel around it. The deal also requires Enbridge to study the pipeline’s replacement, building a tunnel to protect the section at the Straits of Mackinac and improving underwater monitoring. Adding to environmentalists’ urgency: an April anchor strike in the Straits that dented Line 5 and ruptured a Wisconsin utility’s electric cables. Enbridge, headquartered in Calgary, has touted Line 5 as a “vital piece of Michigan energy infrastructure” for meeting Michiganders’ energy needs. The pipeline transports up to 540,000 barrels of light crude oil per day from from Superior, Wisc., to Sarnia, Ont. That includes a stretch beneath the Straits of Mackinac where the pipeline is twinned. Enbridge says about 30 percent of oil flowing through the pipeline stays in Michigan, but the company has not disclosed detailed data on the distribution. Some critics argue no more than 10 percent of the oil stays in Michigan. Enbridge says the pipeline also transports enough natural gas liquids to meet 65 percent of the Upper Peninsula’s demand for propane, an essential fuel during bitter winters. In Wednesday’s report, Groundwork suggests Line 5’s importance to Michigan has dwindled as the state’s refineries increasingly handle heavy crude instead of the exclusively lighter stuff flowing through Line 5 — and as Enbridge pumps more oil through other pipelines across Michigan. Enbridge’s broader pipeline network can transport nearly 1.6 million barrels of day to the Detroit/Toledo/Sarnia region, while local refineries can handle 811,000 barrels each day, the report said. “Even without the 540,000 barrels of oil per day with Line 5, there would still be an excess of 248,000 (barrels per day,)” the report said. The group argues Michigan should re-examine whether other pipelines could pick up the slack from a Line 5 shutdown. Duffy, the Enbridge spokesman, noted Michigan already commissioned a study on alternative ways to deliver fuel that concluded shutting down the line at the Straits isn’t feasible. In the analysis last year, the Calgary-based firm Dynamic Risk noted that, without the line, oil would have to be transported by truck, barge or rail, which has its own risks. The firm “noted correctly that the existing pipeline infrastructure through the region is either at capacity or dedicated to other products and could not handle the products or capacity transported by Line 5,” Duffy said. Groundwork argues a key premise the Dynamic Risk analysis was flawed: The firm weighed how to replace all 540,000 barrels of crude Line 5 sends through Michigan, rather than the much smaller amount that stays in state. “The question we should be asking isn’t how that we help Enbridge move their oil through Michigan, but whether Michigan needs this oil at all,” Lively said. Duffy said it was “important to look at the entire regional system” — all 540,000 barrels per day — when examining alternatives to Line 5, because “some” of the pipeline’s product refined in other states returns to Michigan. As for the Upper Peninsula’s propane? Lively acknowledged that rerouting it through 15 trucks per day or 35 railcars per week, as Dynamic Risk estimated would be needed, could increase the risk of on-land spills. But Lively argued the impact from such spills would be far less devastating than a Line 5 rupture in the Great Lakes. And while Dynamic Risk concluded trucks and trains could not reliably deliver propane to the Upper Peninsula during winter, Groundwork suggested Michigan could avoid that hurdle by transporting the propane before the snow and cold struck. “At the minimum, we need a plan for energy security in the U.P., and it shouldn’t be Line 5,” Lively said. How do you clean up an oil spill in the straits of Mackinac under 3 feet of ice in February? Then, shut down Line 5! I'm pretty sure I know what Canada would do if an American Pipeline endangered its waters. Wait, it does endanger Canada as well. As a property owner in Northern Michigan I would like to see our state government take a more positive stand on this. How many oil spills under Shuette's watch as attorney general, and nothing done? This study makes the same mistake as others before it. Plainly speaking, it is not appropriate to think of Line 5 and Line 78 as independent; they are operated as a system. If there is an outage (or closure) on one of the pipelines, shipments on the other pipeline are reallocated in a semi-prorated way called "apportionment." To illustrate the problem, let's assume a hypothetical scenario in which all of Line 78's product was delivered in Michigan, and all of Line 5's product was transported into Canada. The commonly drawn conclusion, which is reflected in this study and others, is that this scenario reflects a situation in which Line 5 serves no meaningful purpose for Michigan. And, given that there are serious risks associated with oil pipelines, it logically follows that the obvious choice is for Michigan try to shut it down. Unfortunately, as you might expect, the reality is much more complicated. The reality is this: In the scenario above, if Line 5 was shut down, the total demand on the system (Michigan + Canada) would then exceed the capacity of the system (which, without Line 5, is just Line 78). As a common carrier, the surge in demand caused by Line 5's closure would force Line 78 into apportionment, meaning Michigan and Canada would each receive just a portion their respective needs. Thus, even though in this scenario Michigan didn't directly use any of Line 5's product, the end result is that both Canada and Michigan would have shortfalls that they would need to make up in some other way (new pipeline, other pipeline, truck, rail). Also, oil pipelines are common carriers -- there's no mechanism by which Michigan could reserve capacity on the pipeline or somehow "outbid" Canada to ensure Line 78 would remain dedicated solely to Michigan's needs if Line 5 were to cease to exist. To be clear, its still very much a valid question to ask whether the Line 5's risks to Michigan outweigh its benefits and whether the pipeline should continue to exist. But the accidental and/or intentional carelessness of these "studies" is muddying the waters of an otherwise important public debate.